Harley V-ROD LED CONVERSION PATHFINDERLED SoCalMotoGear.com - Professional Grade Motorcycle Lighting - Plug N Play Products - "Riding at night has never been brighter!" HIGH PERFORMANCE LED KIT FOR HARLEY DAVIDSON V-ROD - COMPLETELY PLUG N PLAY. We don't just sell LED bulbs, we sell High Performance LED bulbs...Guaranteed. Ready to Own the Road? Unlike other LEDs, our bulb outputs a fantastic beam pattern. The Power draw is 1/3 of your stock incandescent but while the brightness is upwards in luminosity. Custom designed for Harley V-ROD 2002-Newer except VRSCD/X/F. 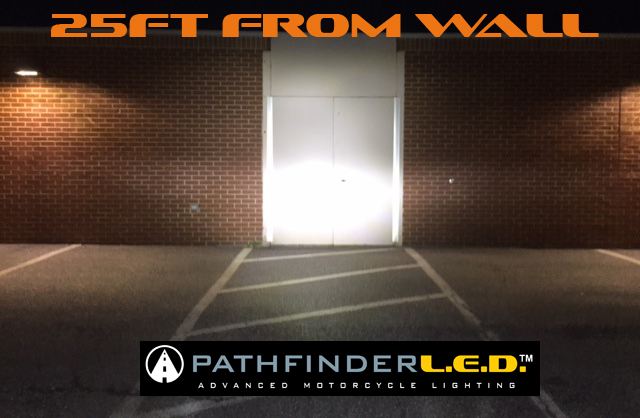 Be sure you have the same type of headlight pictured above/below. This kit will not fit models with the H4 bulbs. See models below for fitment. This professional High/Low Beam LED kit for Harley V-Rod is Plug N Play and will completely replace your factory lighting to LED lighting. This kit will enable you to have LEDs for your LO and HI beams. And with the optional T10/194 50W position bulb, you can replace the dull yellow stock bulb so all your lights match up. Completely ‘N Play installation. See 2-3x brighter and seriously improve your RIDE at night! This kit comes comes with Lo and High Beam LED bulbs. If you want the T10/194 LED position bulb, be sure to choose this option. 2PCS H11SFS LED BULBS: 1 FOR THE LOW BEAMS AND 1 HIGH BEAMS. Always check your bike before ordering. DOES NOT FIT VRSCD/X/F.